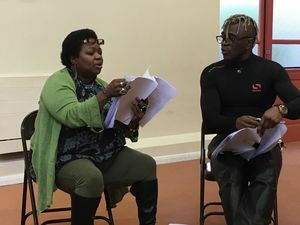 “LIFE’S A CARNIVAL” is a new play based on lives of Haringey community activists Ken Hinds and June Tuitt who also perform in the play. It alludes to historic vibrations impacting on young African Caribbean men, especially in Tottenham, Wood Green and other areas of Haringey. Exploring themes of migration, violence, race and personal redemption, it aims to widen intergenerational dialogue about reducing conflict between young people. An important aim of the play is to engage the community in discussing its themes and to get involved in action together to reduce the harm local young black people are doing to each other.